Third plays sixth in this game, and while this may not be the most exciting game on paper, it should be a match that sees both teams fighting hard for the win. Nigeria are the only team in the group without a win so far and while that is likely to continue in this match, you cannot rule them out. Croatia will definitely fancy their chances of progressing and they defeated Brazil with a big showing in their last outing. Bojan Bogdanović delivered 33 points in that game and he is likely to be one of the key players in this game as Croatia look to provide themselves with the platform to progress into the knockout round. Nigeria were edged out by Spain in their most recent game and it was another example of Nigeria working hard but having little to show for their efforts by the end of the game. The Nigerians were led by Chamberlain Oguchi who provided 24 points in the loss. If he can deliver a similar performance in this game, there may be a chance that Nigeria will finally get something to celebrate in Rio. The bookmakers certainly think that Croatia will come out on top of this match. They should win but it may be that taking Nigeria at +11.5, which you can find at odds of 1.90 is likely to be a smart bet for this game. If you are considering the Over/Under market for this match, you should look to go UNDER 161.0 which you will find available at odds of 1.90. Bet Now! 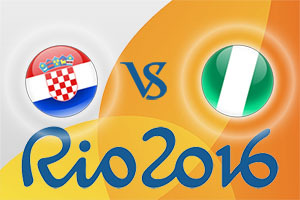 In the double result, a Nigeria half-time, Croatia full-time result is on offer with odds of 5.25. You can back Croatia to be the first team to grab 20 points at odds of 1.30 and if you want to bet on which team will have the highest scoring quarter, you can back Croatia at odds of 1.35. This should be a game that Croatia wins but it may be tighter than you first think. The game starts at 0230 BST on Sunday 14th of August.